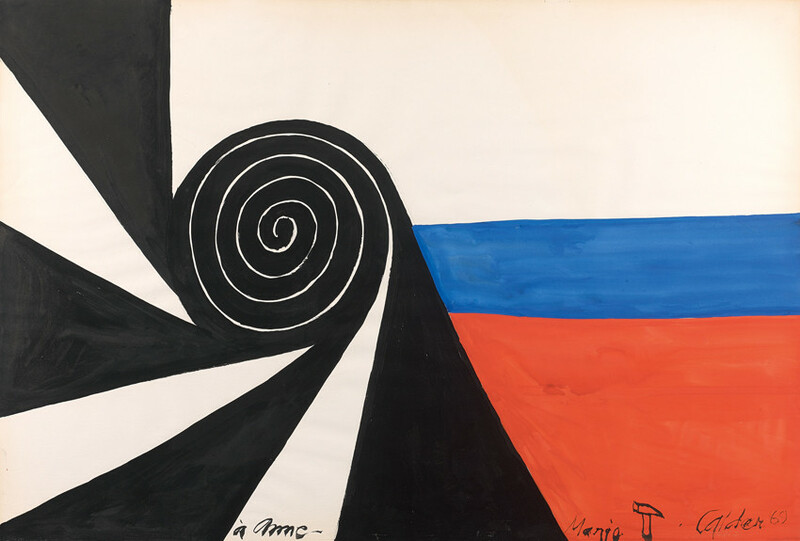 This lyrical painting by Alexander Calder was made in 1969 in the same year that the magnificent new studio ‘Le Carroi’ was completed in the small village of Saché in the Loire Valley. Establishing himself in this idyllic region of France during the 1950s, Calder quickly became a valued member of the Saché community as he hired local craftsmen and commissioned the nearby Tours factory to help construct his famous mobiles and stabiles. ‘Composition’ is dedicated to one particular close friend made during this period, Anne-Marie Marteau. A maths teacher from Tours, Marteau (meaning hammer) was a radical member of the ‘Liberation-North’ resistance movement during the Second World War and frequent visitor to ‘Le Carroi’. Nicknamed ‘Albino’, Marteau organised the first meetings of the resistance in the region to shelter Jews, objectors and foreign soldiers, and established a children’s protection agency in 1946. Calder, amongst other artists such as Max Ernst and Olivier Debré, donated key works to help raise funds for this cause after the war, including the present 'Composition'.